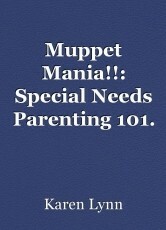 Muppet Mania!! : Special Needs Parenting 101. A teenage girl with Down syndrome is a fan of the Muppets. This is her story. My daughter, Brenda Sarah, 16, is a huge fan of the Muppets. She loves anything having to do with the Muppets; in fact, her room is a Muppets shrine: Kermit, Miss Piggy, Fozzie Bear, Animal, Grover, you name it ... as long as it's Muppet-related, she is in her element. She has stuffed Muppet toys, Muppet games, drawing paper with Muppet characters embossed on each sheet, coloring books, crayons, and even clothes with the beloved characters on them. She can never get enough of them. Never mind that she is in junior high school, in grade seven: she still loves the Muppets and always has, always will. Of course, she gets teased not only about her Muppets obsession, but about having Down syndrome, which she was born with. Because of her DS, Brenda Sarah functions at a much younger level: her mind is like that of a five year old child. She is in special needs classes at school, where she has a teacher and a classroom aide to help her get through each day while I am at work. But she is quite smart, even for having Down syndrome. She knows more than what she lets on and she especially knows a lot about the Muppets and what they do and who they are; it's absolutely amazing just how much she knows! Happily, Brenda Sarah has friends, both at school and here in our neighborhood. She has friends at church, and she has friends for when we go to the doctor's, therapy, or even tot he store. People see her and know her by name; she is a very familiar face, and she is very well liked and appreciated, much to my relief. Sure, it's sad when she gets teased; it breaks my heart, but we tell Brenda Sarah that she is loved and that it is okay to walk away from bad people who don't know any better. Brenda Sarah is always carrying her beloved Kermit stuffed toy or her Miss Piggy dolly wherever we go; if she loses them by accident, she will have a meltdown until the missing animal (or dolly) is located and safely within her arms again; but we always have to stop whatever we are doing, just so we can quiet her and try to keep her calm without her causing too much of a ruckus. This happens at least once or twice a day, or even three to five times a week; we've come to expect this. It's all a part of having a child with special needs. Well, I hate to go, but Richard (my husband) is getting ready to go to work; I will take him there and then I will treat myself to lunch at the Golden Corral before I go pick up Brenda Sarah at her school. Hopefully she had a good day, and hopefully I can enjoy some peace and quiet, not to mention, a freshly made hot meal at one of my very favorite eating establishments. I will write in here again soon; take care and God bless! This is not the last time you will hear about Brenda Sarah or our family! Sweet write, Karen, well done.